Need help teaching your child how to correctly hold a pencil while writing? Or maybe watching your little one wielding the school scissors makes you a tad uncomfortable? The Pencil Grip, Inc. just might have the right solution for you. We recently had the opportunity to try out and review The 3 Step Pencil Grip Training Kit and The Ultra Safe Safety Scissors. This set comes with 3 different grips that are latex and phthalate free. Each grip slides onto a standard pencil or stick pen with a little effort (the material grips so that it stays put once in place). They seem to come in a random color assortment. The set we received for review had a different color for each step, but they were different from those you see pictured above. While the grips are designed to be used successively as your child develops better pencil control, the Pencil Grip says this is only a recommendation---use the grip that is the most comfortable for your child to use. Let’s take a closer look at each of these. I’ve included pictures of the grips in both in my adult right hand and my 8-year-old daughter’s left hand, so you can see how they fit. Step 1 is the Crossover Grip for training. Here’s a side view. Each of the grips has helpful markings that show you where to place your thumb if you are right or left-handed. Here I am holding it for writing. You can see that there is a cape-like part over the top to keep little fingers from migrating around the pencil. This grip is really too small for me (the degree it forces my fingers to bend at is too cramped), but it might work for an adult with smaller hands. Here are some pictures of my 8-year-old using the Crossover Grip (sorry they are fuzzy---it’s hard to photograph a moving hand). Step 2 is to transition with the Pinch Grip. I had not noticed this when I took these pictures, but you can see hair and some fluff sticking to these grips. They are a little “sticky,” which helps them grab onto the pencil, but it also causes them to collect bits of fluff. Again, while I can use this grip, it makes my hand feel cramped. Definitely better for smaller hands. Step 3 is the Pencil Grip Original. This grip was the most comfortable in an adult hand, but still a little small. 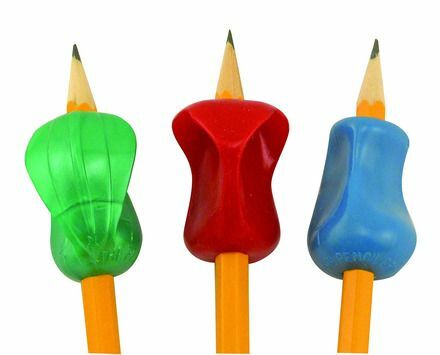 The Pencil Grip Original continues to provide comfort and ease of correct finger placement, but is not restrictive like the other two styles. What did we think of the The 3 Step Pencil Grip Training Kit? You can see how her hand looks a little more relaxed and she’s not trying to cling to the pencil with all five of her fingers as she is without the grip (no wonder she gets tired when she’s writing). The Pinch Grip is a good fit for her now, so we’ll continue to use it. If you are an adult who is looking for a grip to help with carpal tunnel syndrome (that’s me) or arthritis, these grips may not work for you. Both my husband and I (he’s a lefty) found that they were uncomfortable. The angling is just not right for our hand spread. If you have a smaller hand, the Pencil Grip Original may be worth a try. Let’s talk about the The Ultra Safe Safety Scissors. We also received these ingenious scissors that are designed to keep kids ages 3+ safe while cutting. The Ultra Safe Safety Scissors have a permanently affixed plastic guard that the bottom blade slides in and out of. The yellow plastic piece swivels and can be used as a “spring” so that the blades automatically open again after closing. The size is perfect for small hands, but I also had no trouble using them as an adult. What do we think of the Ultra Safe Safety Scissors? It is nigh near impossible to cut yourself with these scissors! They cut well, even for lefties (many scissors don’t work for lefties AT ALL). They fit small hands well, but are still usable for adults---how many times have I used the kid scissors because mine had disappeared? I’ve been lucky…I have never had a child cut his or herself with a pair of scissors (knife, yes, not scissors). Kids like to cut “stuff,” which is part of the reason why many “safe” scissors are dull or will only cut paper. The Ultra Safe Safety Scissors would not have prevented any of these misadventures, because they are not designed to do that. If your primary concern is to keep your child from cutting herself, the Ultra Safe Safety Scissors may be a good choice, but if she tends to cut other stuff, you may want to look for a different solution. 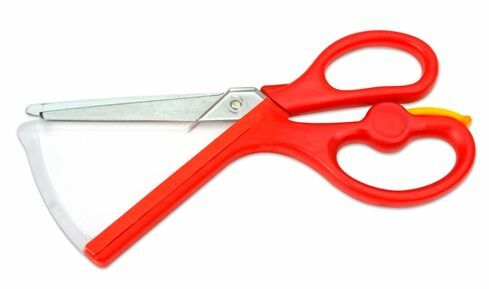 The Ultra Safe Safety Scissors are much heavier than regular kid scissors and perhaps too heavy for little hands. My daughter is 8, so a little older than the target age range on this product, and yet she still felt that the weight of the guard was interfering with her cutting and causing her fatigue. The action is not smooth enough. If you have the “spring” turned off so that the scissors don’t automatically open, it takes more force to reopen them than with our other kid scissors. This leads to jerky cutting, which you can see in the video, and tired hands. The “spring” that forces the blades back open automatically requires a fair amount of force to overcome---my daughter felt that it was too hard to cut using the spring and also led to jerky cutting. Smaller children are less coordinated and have less strength in their hands than my daughter. They may find the Ultra Safe Safety Scissors frustrating to use. The Pencil Grip, Inc.’s The 3 Step Pencil Grip Training Kit and The Ultra Safe Safety Scissors can both be purchased from Amazon.